Fresh off the press and bouncing to life are our new spring/summer iPhone 6s/6 cases. Drawing inspiration from the spring/summer 2016 catwalks and the hottest new color trends, this new collection offers military-grade drop protection for your iPhone 6s/6 in perfect seasonal style. Some designs are also available on our iPhone 6s Plus/6 Plus cases, iPhone SE cases and Samsung Galaxy S7 cases. Speck’s in-house CMF designers, Roxy and Iris, worked around the clock researching and designing the perfect spring/summer collection, giving you lots of choice and the opportunity to find a design or color that fits your personal mood or taste. There are four different themes to choose from, resulting in a range of stylish iPhone cases you’ll be proud to show off, whether you’re hitting a festival or the beach this spring and summer. 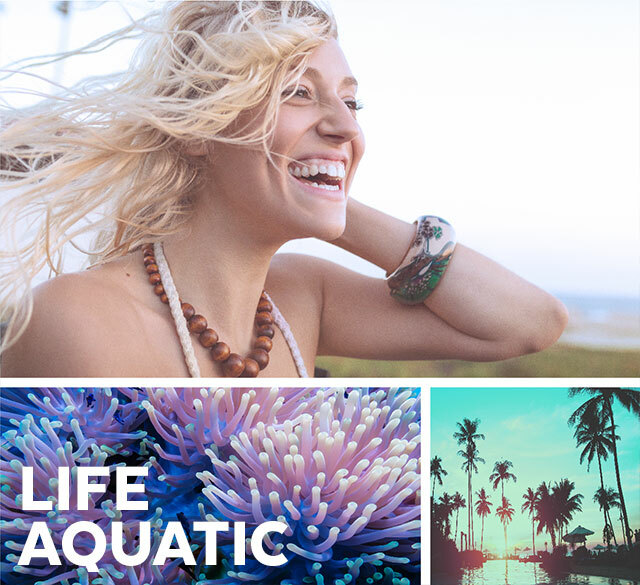 Dive into our Life Aquatic spring/summer theme. These light and delicate pastels and patterns will get you in the mood for your summer vacation. “Life Aquatic conjures up dreamy images of chilling on the beach sipping a cocktail. We designed this theme with peace and relaxation in mind” says Roxy of these ethereal designs. Whether you’re heading to the beach this summer or simply want to echo the feel good beach vibes, you’ll find a Life Aquatic iPhone 6s/6 case that’s just for you. Show your playful side and wrap your iPhone 6s/6 in our lively Pineapple pattern or chill out with our subtle Sand Grey colored CandyShell Grip case. After all, one of the Top 10 spring 2016 style trends according to Stylecaster is Beach Bum Chic or Ton Sai Chic. Now your iPhone 6/6s case can protect your device and be on trend wherever the summer takes you! Maybe you dig a more athletic, energetic summer vacation. Jump into our Desert Canyon spring/summer theme and wrap your iPhone 6s/6 in stark, brilliant colors. “Our Desert Canyon theme is young and full of energy and is modeled on the types of color schemes you see in athletic wear. These designs will really showcase your adventurous side!” Iris commented when asked about her inspiration for Desert Canyon. Get lost in the desert wilderness and dress up your iPhone 6s/6 with our Desert Cactus design or brighten up your day with our summery Playa Geo Citrus case. With bold pops of color against backdrops of muted base colors, you’ll find wearable, eye-catching combinations in our Desert Canyon range that look as great as they protect. Go one step further and turn up the color dial with our fearless Jungle Dream themed iPhone 6s/6 cases. Perfect if you’re getting festival ready, these wild exotic patterns spring off these cases through a vibrant, saturated color palette reminiscent of more exotic locations, such as Hawaii and the South Pacific. “We had a lot of fun designing the spring/summer Jungle theme. We got a little wild and really went to town with the color palettes. We love the result!” says Roxy. Turn heads and express your daring side with our Wild Tropic Fuchsia design or get washed away with our Atlantic Green/Periwinkle Blue CandyShell Grip iPhone 6s/6 case. Get set for summer while fully protecting your iPhone 6s/6 with our Jungle theme. As Fashionista reported, one of spring’s hottest trends on the Paris catwalk this season is outerwear with a taste of Hawaiian breeze. Why not wrap your phone in Hawaiian feels too?! For our fourth spring/summer theme for iPhone 6s/6 cases Roxy and Iris created a collection of luminous, and elegant colors and patterns for our CandyShell Inked Luxury Edition range. If you have a love of the finer things in life, you’ll find the iPhone case you’ve been looking for in this selection of eye-catching designs. “This is the most sophisticated color palette yet for Speck Products.We’ve brought it to life using our exclusive INKED technology. Metallic layers with digital luminous prints create a one-of-a kind 3D effect that almost seems to move. The only trouble is you won’t want to stop stroking your beautiful case!” Iris explains. If you love florals, take a look at our luscious Hawaiian Silk /Periwinkle Blue design, or if you have a more modern style, check out our Woven Geo case. “We designed these cases to be so precise and perfect. I just love how tactile they are with their refined, matte finish” enthuses Roxy of the new spring/summer Luxury Edition colors. Protection never looked so beautiful! Whatever mood you’re in this spring or no matter where summer takes you, these stylish iPhone cases will fit right in. Check out all of Roxy and Iris’s spring/summer designs and all of our Samsung Galaxy S7 cases, iPhone 6s/6 cases, iPhone 6s Plus/6 Plus cases and iPhone SE cases and get ready to protect and style your smartphone in time for vacation and festival season!